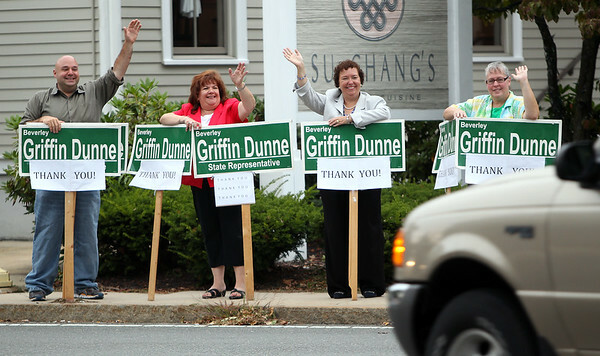 Democratic State Representative candidate Beverley Griffin Dunne, second from right, waves to passing cars outside Su Chang's on Lowell Street in Peabody along with campaign manager Jason Burnett, left, and supporters Kim Bressler, and Diane Bugler, right, on Thursday afternoon after Griffin Dunne won the primary over Jim Moutsoulas and now will face off against Republican State Representative Leah Cole. DAVID LE/Staff photo. 9/11/14.